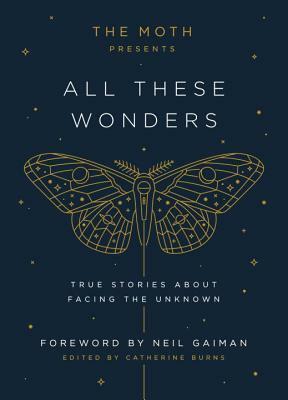 From storytelling phenomenon The Moth, 45 unforgettable true stories about risk, courage, and facing the unknown, drawn from the best ever told on their stages. High-school student and neuroscientist alike, the storytellers share their ventures into uncharted territory and how their lives were changed indelibly by what they discovered there. With passion, and humor, they encourage us all to be more open, vulnerable, and alive. Sometimes you pick a book and you're not sure why. That was the case for me and this book. I had no idea what was drawing me to it, but once I started reading, I knew that I'd made the right choice. While this book can be read in small snippets, I couldn't stop reading and actually read this in one sitting. Every story had something in it that made me nod or smile or even cry a time or two. I truly believe that there's something in it for every single person out there. My one and only complaint was that the stories in the book are almost all from well known people. One of the things that draws people to The Moth are the average people who get up and talk. They were left out of this tome and I really wish that they had been more included. I'm just an average person and I really was looking for an average person to connect to in this book. That being said, I know that this book is going to go onto my shelf and be one that I come back to time and time again. I sincerely hope that they do more in a series of books because storytelling is such a powerful tool and we all have something to share.